Each piece is uniquely scaled to fit the dimensions of the contemporary home and entirely handcrafted in the USA from sustainably harvested forests and finished with a natural linseed oil & wax finish! Additional Details/Specs: The clean, simple lines of American Arts and Crafts design give this bed charm and style. The head and footboards come assembled with mortise and tenon joints throughout..
Pacific Maple Beds come with a sturdy platform of closely spaced slats attached with jute webbing and bolstered by a center beam (*center beam in all except twin beds). Available in both a slat frame option (no boxspring) or a boxpring option. Available in a Regular Footboard Style (main image) or a Modified/Low Footboard Style (below). 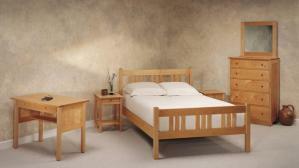 The Arts & Crafts bed with modified low footboard option allows for sitting on the foot of the bed. The box spring version with a 19-inch box spring/mattress set. The rails on the box spring beds are attached at a lower position on the posts. Four slats support the box spring and mattress.